Love. Nightmares. Angels. War. A fast-paced, compelling debut novel from a fresh new voice in YA. I really wanted to love this book. 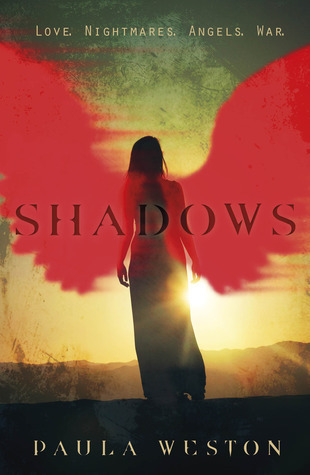 I have had a hard time with angels in the apst but having read most of Lauren Kate’s Fallen series and loved it, I thought I’d give Shadows a chance, and I did. I took the bold decision to abandon this book after 240 pages… thats more than halfway through the book. I really liked the main character but I just didn’t feel anything for anyone else and I didn’t care about the storyline. Unfortunately Gaby wasn’t enough to keep me going but I may read the final chapter just to make sure she’s ok. I feel really bad for giving up on this but it wasn’t working for me at all. The problem with angel books is that the all feel very samey to me. This felt exactly like Starcrossed and Fallen and all the other series’ out there. Starcrossed was one I read the whole way through but didn’t follow on to the next book and the Fallen series has something in it that I am drawn to. This didn’t unfortunately but thankfully I know other people who really enjoyed it. If you want to read some reviews by others who have enjoyed this one, or at least finished it head on over to goodreads. I know a few of my fellow bloggers said on twitter that they loved Shadows so I do seem to be in the minority with this one! One particular blogger who I know really enjoyed Shadows is Michelle over at Much Loved Books, click on the link to read her review! Shadows was released on January 3rd by Indigo. I would just like to take the time to say thank you to Indigo for sending this one for review, it is appreciated. I’m not a big angel fan either. Shame this one wasn’t for you.